Ramat Gan, Israel, June 27, 2018: Chinese diamantaires will have their large diamonds polished in Israel, in a new manufacturing facility that the Israel Diamond Exchange (IDE) and Israel Diamond Institute (IDI) are now building within the IDE complex. 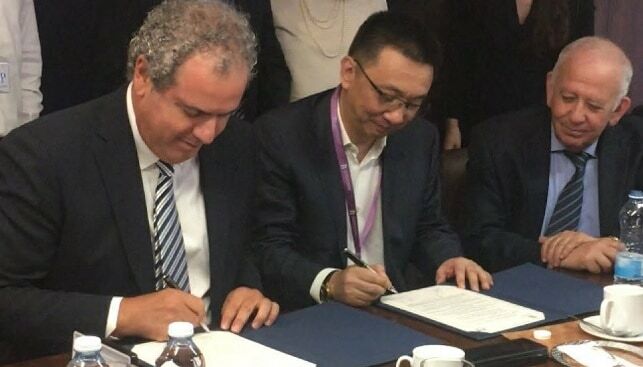 This was one of the areas of cooperation agreed to by IDE President Yoram Dvash and Shanghai Diamond Exchange (SDE) President Li Qiang, with the signing of an historic MOU between the two bourses in Ramat Gan this week. Representatives of both sides noted that this was indeed a rare case of “globalization in reverse”. “This is a very unusual situation, whereby Chinese diamantaires will send their large diamonds to be polished in Israel. It is testimony to the well-known expertise of the Israeli polishers and the technological advances of the industry here,” said IDE President Yoram Dvash. “The establishment of our new polishing plant for large stones is part of the technological revolution we are implementing at IDE, which includes the launching of the largest online store in the world for selling diamonds. Technology is the way to lead the industry on a successful path to the future, especially in light of the recent challenges we have been facing”. The MOU was signed during the visit of a high-level delegation of SDE management and members. On hand to greet the delegation were Jacob Korn, President of the Israel Diamond Manufacturers Association (IsDMA), Boaz Moldawsky, Chairman of IDI and the IDE Board of Directors. The agreement covers several areas of cooperation, including making available offices and spaces for trading, easing the way for members of each bourse to join the other, and allowing participation in courses given by each of the exchanges. The MOU also agreed that each side would help the other to develop its diamond industry with “the recognition of the importance of each side to the international diamond and jewelry industries and the mutual interest in cooperation”. IDE and IDI are investing over $3 million in building the new plant for polishing large diamonds, which will be the most technologically advanced facility in the world. The plant will include two polishing centers located within the bourse complex, will measure 1,100 square meters and will employ about 150 polishers. Although most of the polishing of small stones has moved abroad, mainly to India, the polishing of larger diamonds has largely remained in Israel. It is hoped that the new facility, which will offer maximum security as well as the most advanced technology, will entice diamantaires who are now polishing abroad to return their polishing activity to Israel. The factory is expected to polish thousands of stones per year ranging in size from 5 to 10 carats and above. The factory is expected to open in late January 2019, during the next International Diamond Week in Israel.